Three years of lack of evidence – Three years that fucked up our lives. The Fenix case uproar, consists of a lot of accusations of many crimes, ranging from the one of so-called “promotion of terrorism” to the one of preparation of terrorist attacks. These are the ones that were most discussed at the latest Municipal Court Hearing in Prague. During their verdict, the judge acquitted all the five defendants of the Fenix 1 case. Is it a victory? Why this decision isn’t final? Followed article is a translation of a month old overview over the court hearings and some analyses of our situation and experience, originally written in Czech language. Translated in English by Antifenix. Three years of lack of evidence – Three years that fucked up our lives. The Fenix case uproar, consists of a lot of accusations of many crimes, ranging from the one of so-called “promotion of terrorism” to the one of preparation of terrorist attacks. These are the ones that were most discussed at the latest Municipal Court Hearing in Prague. 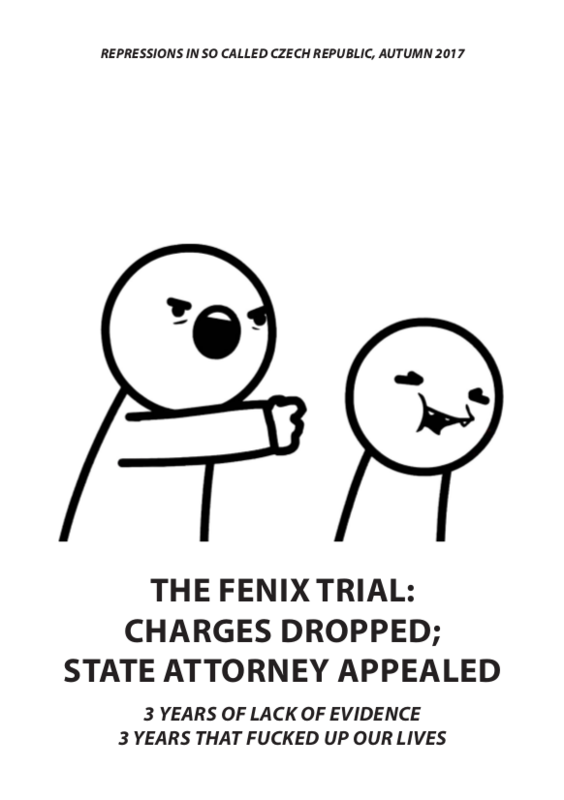 During their verdict, the judge acquitted all the five defendants of the Fenix 1 case. Is it a victory? Why this decision isn’t final? Followed article is a translation of a month old overview over the court hearings and some analyses of our situation and experience, originally written in Czech language. Previous post: So… #Catalonia is Independent Now?